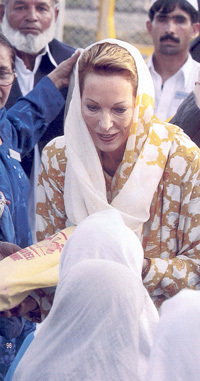 Princess Salimah is welcomed into the homes of Afghan families in the camp of Badaber. 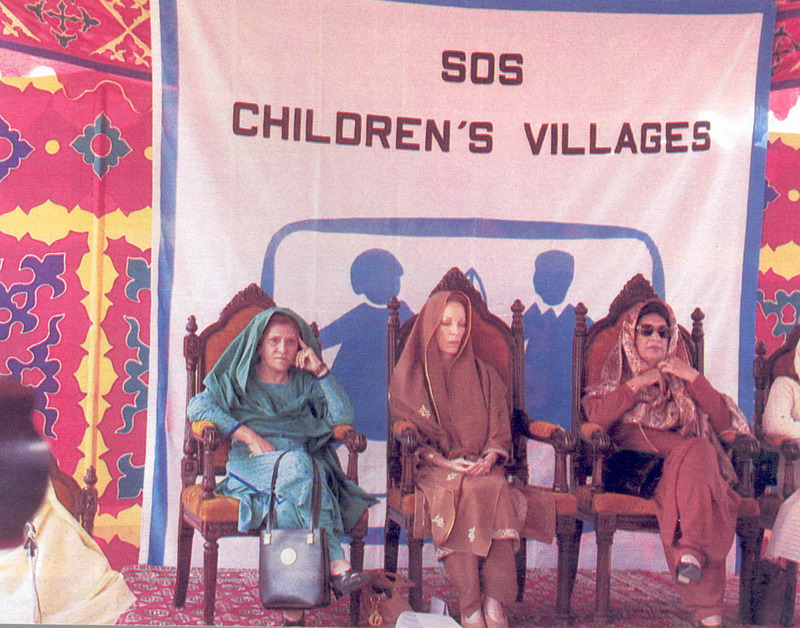 Since her divorce from the Aga Khan, British-born Salimah, aka Sally Croker Poole, has made a new life helping the world's most disadvantaged children through the charity SOS. 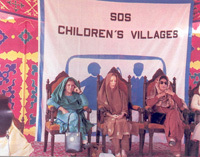 SOS has opened playgrounds for the children in the camps. SOS has opened playgrounds for the children in the camps. Initially, the youngsters were bemused by the activities on offer and some even went as far as trying to break them up. But once they were taught how to use swings and slides, they had a whale of a time, and Salimah now reckons the play areas have been one of the Pakistani project's biggest successes. She joins dignitaires at the project's opening. Salimah strokes the donkey of a young refugee in Badaber camp. Her overall impression of the kids was that they were "terrific, naughty, lovely children". And although she lived for 25 years in great luxury as the wife of the Aga Khan, she says she was not fazed by the poverty in the camps. "I was born on the Indian subcontinent, " she explains, "and I was an army kid, which meant we traveled all over the place - wherever my father was posted. So it seems like a part of my DNA, I mean I don't feel shocked or shattered, I don't look at it with a stranger's eye". For 25 years, British-born former model Sally Croker Poole lived in the height of luxury as the Princes Salimah, wife of the Aga Khan - the spiritual leader to millions of Ismaili Muslims, and one of the richest, most prominent men in the world. But once her two sons and daughter were grown up, after a complicated divorce, she was free to embark on a very different way of life, working directly for some of the world's poorest, least visible children. Shortly after her divorce settlement, Sally travelled to Polynesia. And it was there that a friend introduced her to Children's Villages, a low-profile but extremely extensive organisation which sets up 'villages' to take care of maltreated or abondoned children - it is in fact, as she was to find out, the largest self-funding charity for destitute children in the world. By the time SOS had finished building Polynesia's first village, Sally was so impressed with the supportive and the 'normal' family environment it offered, she wanted to become involved, not just as a patron but in a hands-on kind of way. Now, seven years later, at the age of 62, she is the first international ambassador for the organisation, making frequent journeys from her home in Geneva to some of the 132 countries around the globe where SOS operates. I wanted to do something hands-on and active. How do you know what you're going to do when you've been married for 25 years? So SOS just happened to answer a lot of things for me. Most recently, she has been in the Afghan refugee camps of Shamshatu, Azakhel and Badaber, all situated in the vicinity of Peshawar, Pakistan, accompanied by her companion, French lawyer Philippe Lizop. Accomodating hundreds of thousands of refugees, these camps are made up of mud huts and makeshift shelters. They have little or no infrastructure, even though to many they have come to represent home. But despite the conditions, the message Sally brought back was one of hope. The kids, she said, are just "terrific. Naughty, lovely children". Princess Salimah, what was the trip to Peshawar all about? "SOS Pakistan has started this fantastic Afghan relief programme this year because there are simply not enough medical centers or schools in the camps. In two of the camps we went to - Azakhel and Badaber - there was no outside help at all. So in March we opened schools and basic health centers in the camps and also a 50-bed hospital in Peshawar." What struck you most about the kids you met there? "Somebody said to me, 'I suppose they all just sit around with nothing to do?'. But of course the don't. They're kids. They were born in the camps and they don't know any other place as home. They grow up there, get married there and too many of them die there." Did they strike you as optimistic? "The ones we met were terrific. Naughty, lovely children. They talked about wanting to be helicopter pilots and soldiers, and nurses and doctors when they grow up, just like children all over the world. They don't talk about going back to Afghanistan. They don't know Afghanistan. And, as far as the parents go, until the international community helps to get that country back on its feet with an infrastructure including proper health care and education, who would take their child back?" Coming from the background you do, how does the poverty you witnessed in the camps affect you? Well, I was born on the Indian subcontinent and I was an army kid, which meant we traveled all over the place - wherever my father was posted. So it seems like part of my DNA, I mean I don't feel shocked or shattered, I don't look at it with a stranger's eye." I absolutely do not regret the jewels I sold. I've only got one pair of ears and one neck. And the sale has enabled me to live a more balanced life. After you divorce in 1995, you auctioned off a large part of your jewellery collection for nearly £18 million. Do you miss the jewels you sold? "Absolutely not. I've only got one pair of ears and one neck. And the sale has enabled me to live a more balanced life." Don't you feel vulnerable as a British citizen in a zone which harbours some anti-British feeling? "Oh no. Being part of such an international organization, I don't feel British, I just feel SOS-ish." Don't you feel British anymore in general? "I do, but I haven't lived in England since 1969, though I've always been to and fro because my mother and brother are there. I do feel very British, but I don't think being British is any different from being Chinese or Norwegian when you're in the business of helping children." How did you initially get into SOS? "Purely by chance actually. I'd never heard of it, even though it had been going since 1949 and had ten million supporters worldwide. I was just divorced and I was in Polynesia on holiday. SOS were building their first village there, and Jacqueline Flosse, the President of French Polynesia's daughter, took me to see the village under construction. I went back a year later and caught what we call the SOS virus. "I was particularly sold on the fact they don't separate brothers and sisters. And also because I had no idea that that kind of thing went on - that children who are not necessarily orphans are taken away from their parents because of severe treatment. Anyway, the children I'd seen go in the year before in pretty poor shape had spent the year with a 'mother' in a 'home' in a 'village' and had just turned into supper kids. The mothers are, of course, all supported by child psychologists to help the children overcome past traumas. "The whole package was very inspiring. A year of regular daily care, affection, good meals and school had been, for them, a second chance at life." Had you done anything like it before? "I'd done a lot of visiting hospitals and schools previously, but by the time I visited Polynesia I wanted to do something hands-on and active. How do you know what you're going to do when you've been married for 25 years? So SOS just happened to answer a lot of things for me." Do you think you'll continue in your current role for some time? "I hope so. I am 62. Some of the travel is quite wild but I don't mind traveling at all. There are moments of high drama, but it's fun." What a wonderful job to have chanced on. "Yes. Wasn't I so lucky? You know, you don't want to be inactive, and having regained my freedom I didn't want to be sitting around just twiddling my thumbs - but then this thing fell out of the sky."